If you could see the workings of the universe simply by looking up into the sky, would it make you more or less inclined to believe in the existence of God? If the world was so mechanical that you could see the Earth and Moon following their prescribed clockwork pathways through the heavens, how much would a concept like free will play in your view of humankind? These are questions that Jay Lake edges towards in the third and final volume of his trilogy, following Mainspring (2007) and Escapement (2008). That he approaches them at all makes this the best and most interesting part of this megawork, though it has to be said that Lake avoids confronting either question directly. Indeed the whole trilogy can be seen as an exercise in avoiding the issues raised by the world Lake has created. The universe is clearly and visibly deterministic; no-one could grow up in this world without seeing every day that the earth is a machine and everything upon it must be carried inescapably upon the track laid out for it. Yet his characters are not just imbued with free will, they are imbued with the inherent belief that free will is an unquestioned part of what it is to be human. And Lake never once considers how such a contradiction is possible. A massive wall encircles the Earth at the equator. Atop this wall are the massive brass teeth that carry the planet along its trackway through the heavens. The division of the world has led to a different history than our own. The northern world, at the beginning of the twentieth century when this story takes place, is divided roughly between the empires of Great Britain and China, though two secret societies, the Silent Order and the White Birds, complicate the political structure. 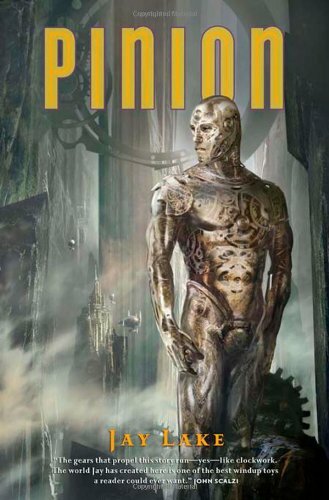 What complicates it further is that along the Wall, where both Empires are attempting to find ways to cross into the southern world, a host of strange, not-quite-human creatures have developed, including vicious flying men and a race of robots who owe their origin to the biblical Solomon. The action picks up immediately where Escapement left off. Paolina, the child of the wall who, more or less by accident, invented the "gleam," a watch-like device that she can use to transport objects instantly, is attempting to cross the Equatorial Wall. Emily Childress, the redoubtable librarian who finds herself acting as a representative of the White Bird, and Angus al-Wazir, one-time Chief Petty Officer in the British navy, are aboard their renegade Chinese submarine fleeing the might of the Chinese Empire. Boaz the Brass man is a prisoner aboard a Chinese airship but still dreaming of pursuing Paolina. These threads continue inexorably, with Boaz, Childress, and Paolina taking their turn as viewpoint characters as before. But a couple of previously minor characters are elevated to the rank of viewpoint in order to add something fresh to the story. Wang was the researcher that Childress encountered at Singapore, but now he is dragooned by the Silent Order to lead the pursuit of Childress, accompanied by a monk who appears to have the ability to become invisible. Kitchens, meanwhile, is the Admiralty clerk (spy and assassin) who originally sent al-Wazir back to Africa but now he is in turn dispatched to the mad enterprise to dig under the Equatorial Wall, though he has secret instructions from Victoria herself that involve him in a very different enterprise. The novel is set two years or more after the aged Queen Empress actually died in our universe, but here she has been preserved alive in a vat of strange fluids: one has to wonder why so many steampunk authors seem to believe that considerably less advanced technologies are capable of things far in advance of our own capabilities. Around these various escapades, which involve criss-crossing the globe at an alarming rate in a variety of steampunk conveyances, notably airships and submarines, there is a major war brewing. In geopolitical terms, this seems to be the inevitable result of two mighty empires rubbing up against each other as they race to find a way to reach the southern hemisphere. In novelistic terms, however, it is presented as having been triggered by the actions of Paolina in the previous volume. Either way, it means that whenever the action flags—and in a novel that mostly consists of several different characters each making incredibly long journeys with not a great deal happening along the way, there is certainly a tendency for it to flag—Lake can just conjure up an enemy airship or an attack by flying men, and suddenly there's a firefight to spice things up. There are quite a few firefights during the course of this book, most of which seem to start by chance and end without materially affecting the plot. In among all this, Paolina manages to cross the Equatorial Wall without facing either the danger or the exhaustion that Hethor endured making exactly the same journey only two volumes ago. The south that she discovers is more complex than the oddly lush but largely depopulated landscape that Hethor crossed. But the world that Lake presents is, in postcolonial terms, distinctly orientalised: the people are tribal and it is a landscape of mystery, belief, and magic as opposed to the rational, technological world of the north. Here Paolina meets Hethor, notably scarred by his own adventures but exuding an almost Buddha-like calm, who teaches her to properly use the "gleam." She learns to move instantaneously from one place to another without the resultant mass destruction that had hitherto accompanied use of the device; but she also meets Gashansunu, a tribal witch who can achieve the same result by following her "wa," her soul, through the spirit world. Significantly, when Gashansunu follows Paolina back to the north she loses touch with her "wa": for tribal peoples to come into the technological world is to lose their soul. Meanwhile, Wang, having started out chasing Childress, finds himself collaborating with her as they conclude a relatively stress-free voyage to the headquarters of the White Bird on Malta. And Kitchens, having been battered about by just about everyone he comes into contact with, links up with Boaz and sets off back to Europe. Of course, in a plot turn of clockwork precision, they all come together at the last minute for the final climactic battle that allows Kitchens to complete his secret mission, and in one fell swoop bring about an end to the war and a reconciliation of all the parties. All three novels read well: Lake has a knack of creating colourful and attractive characters, and his action scenes are vivid and startling. But in the end I cannot help but feel that the world we are exploring could have benefitted from a more thoughtful plot. one has to wonder why so many steampunk authors seem to believe that considerably less advanced technologies are capable of things far in advance of our own capabilities. Isn't that one of the core genre conventions of steampunk? Isn't it, in fact, the main thing that differentiates steampunk from historical adventure fiction? Intelligent brass automatons, lightning machines, steam-powered dreadnaught airships, ray guns—it seems to me that such elements are a major and essential part of what steampunk is as a genre.